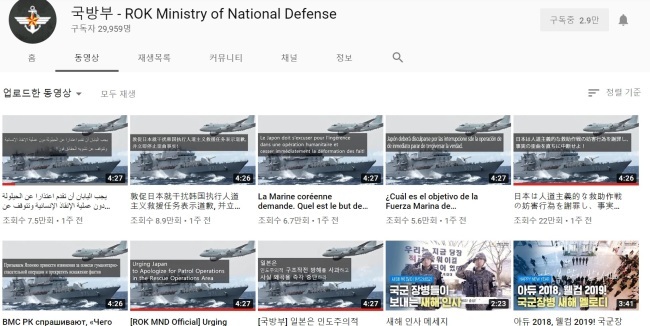 While the ongoing clash between Seoul and Tokyo over a recent radar incident at sea shows no signs of abating, it has also triggered controversy on YouTube, with the defense ministries of the two countries explaining their positions on the online platform. Japan was the first to take the issue to YouTube, uploading a 13-minute video of the incident to its YouTube channel on Dec. 28 with subtitles in Japanese and English to reinforce its accusations against South Korea. The video was shot from the Japanese patrol plane at the center of the controversy. After expressing regret over the video, South Korea’s Defense Ministry also released videos in early January in eight languages -- Korean, English, Japanese, Chinese, French, Spanish, Russian and Arabic -- using Japan’s footage. As of Thursday, all eight versions of the video had recorded at least 50,000 views. The Korean version attracted 1.94 million, as compared with 640,000 for the English version and over 220,000 for the Japanese version. “On the first day when we released the Korean and English versions (Jan. 4), the comments were filled with Japanese and (the video) received thousands of ‘dislikes.’ The next day, South Korean users came to counterbalance (the dislikes) with ‘likes,’” a ministry official said. According to the ministry, Japanese make up more than half of the viewers of the videos in all eight languages. The comments came mostly from South Korean and Japanese users, many of whom traded insults and echoed the arguments of their respective governments. Some Japanese users also alleged that the South Korean warship and the North Korean ferry were making secret cargo transfers. South Korean users lashed back, urging Japan to apologize for flying its warplane at such a low altitude, too close to the South Korean destroyer.